One of my favorite low-carb snacks, hands-down, is beef jerky. I have tried my fair share of brands and I like all kinds of flavors from sweet to spicy and everything in between. The only problem with jerky is it is usually so full of preservatives that it goes from being something semi-healthy to snack on, but something that may not even be mostly meat anymore. I completely understand why it’s full of these things, as obviously meat isn’t typically shelf-stable if thrown in a bag, but I still want to try to cut them out as much as possible. The other issue with beef jerky is it is expensive. I can admittedly finish off a large bag by myself in just a couple of sittings and that turns into one expensive snack really quickly. I always thought you had to own a dehydrator in order to make things like jerky. I did a little research and learned quickly that you can actually make it in your oven! I was so excited to get started on this project and my husband was, too! I was able to get (1) 2.5 Lb Roast (London Broil is best- you want the leanest steak you can get) for $10. This yielded approximately 1 3/4 pounds of jerky. For me, that is a pretty good deal considering a 16 oz (1 lb) bag of jerky usually costs $15 or more dollars for my favorite brand. This jerky has a sweet taste, kind of like a teriyaki. This is my favorite flavor for jerky. You can always adjust the ingredients or add some that you desire more. 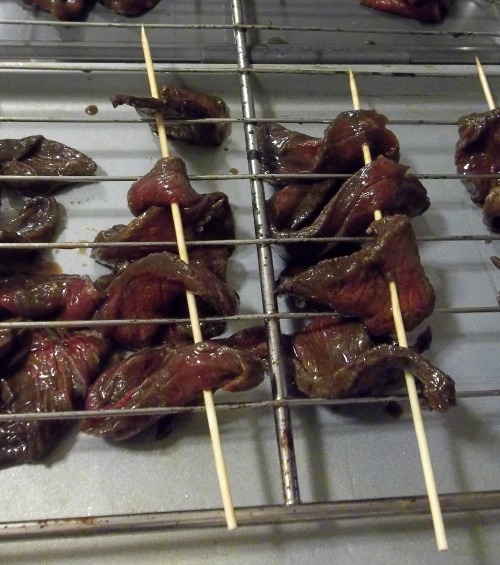 One trick I saw on a website was to use skewer sticks and hang the jerky rather than lay it down. I really think this is ideal because it dries more evenly and since air is able to circulate, it also dries more quickly. 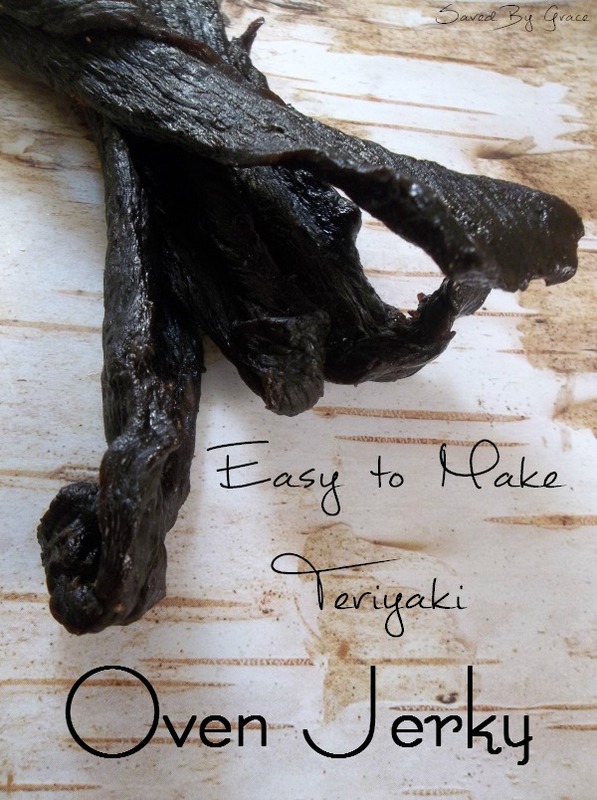 I hope you enjoy making this delicious jerky! Cut all visible fat off the meat. You don't want to leave any because it causes the meat to go rancid quickly during the process and when in storage. Cut the meat into strips that are pretty thin, but not easily torn. Set aside. Mix all of the ingredients well in a bowl. 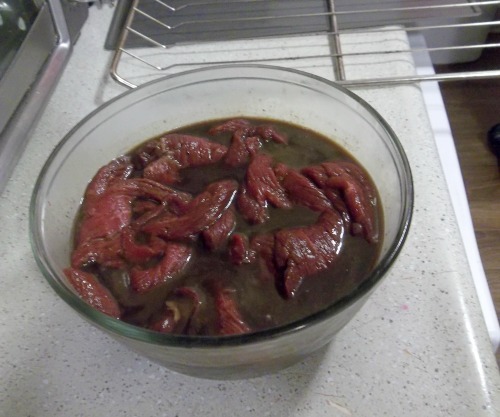 Place your meat in the bowl overnight, covered, in the fridge to marinate. When you are ready to start the drying process, soak your bamboo skewers into water for approximately 30 minutes. Take them out and start stringing meat, longways, on the skewers. I was able to fit about 4-5 strips per stick. You want enough space between them to let air circulate. Line your oven on the lowest rack, closest to the bottom, with cookie sheets. Move your second rack to the top space. Place your skewers on the rack and allow the meat to dangle between the slots like shown in the picture above. Turn your oven on to the "warm" setting if you have a dial style oven or 170 F if your oven is digital. Leave in the oven for approximately 4-4.5 hours. Keep an eye on it as ovens will vary. 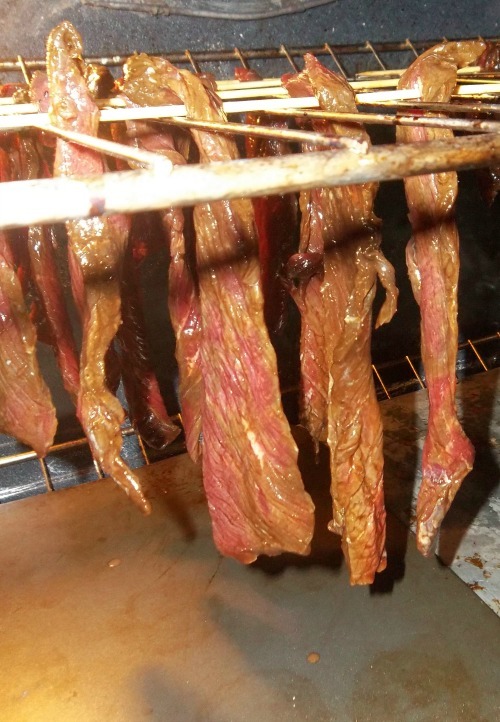 Your jerky is ready when it is tough, but not too dry and there is absolutely no more "juice" coming out of the strips. Homemade Jerky needs to be stored in the fridge. I suggest not storing it in a plastic zipper style bag as it can harbor bacteria. I recommend a bamboo or glass container with a lid. It should keep for approximately 2 weeks if stored this way. This is a great idea for jerky. My friends go hunting all the time and because of that have jerky quite often. 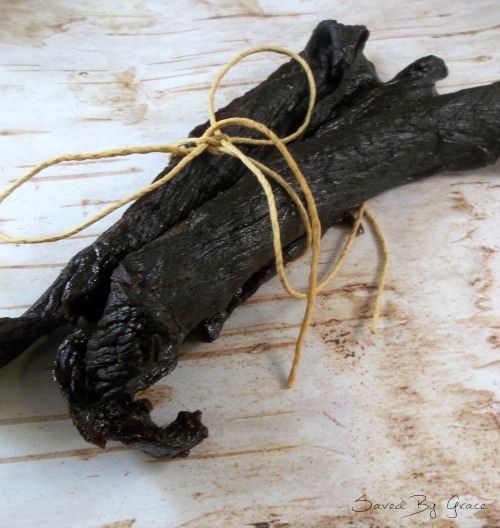 I am not an avid hunter but, with this recipe I can make jerky just the same. Thanks for sharing. Sure! Thanks for stopping by, Johnny! Didn’t know you could use an oven either. Is there a reason why it won’t keep for longer outside of the fridge though? It doesn’t contain any preservatives like most packaged jerky does. Never knew that fat was a main culprit of making beef jerky go bad. 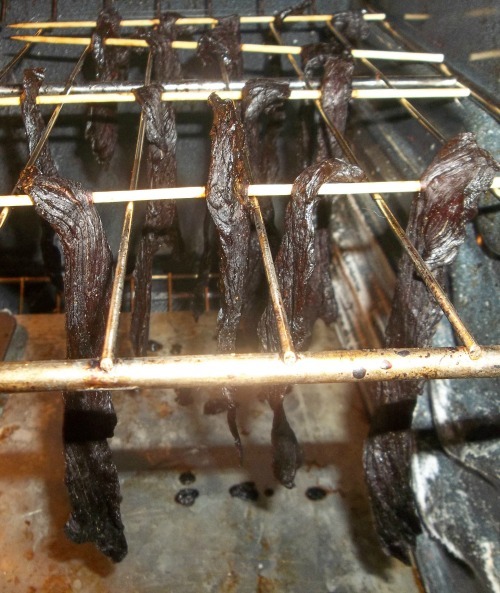 Thanks for sharing this new way of making jerky.